Geek-Girl has returned with a special for Free Comic Book Day! Mysterious new villain Lightning Storm attacked rookie super-hero Ruby Kaye (a.k.a. Geek-Girl)’s city of Maine – destroying points of authority, including police stations and Portland City Hall – in a bid to take control of Maine. In a desperate battle to the end, Ruby took her down, but not before seemingly being electrocuted by Lightning Storm’s powers. 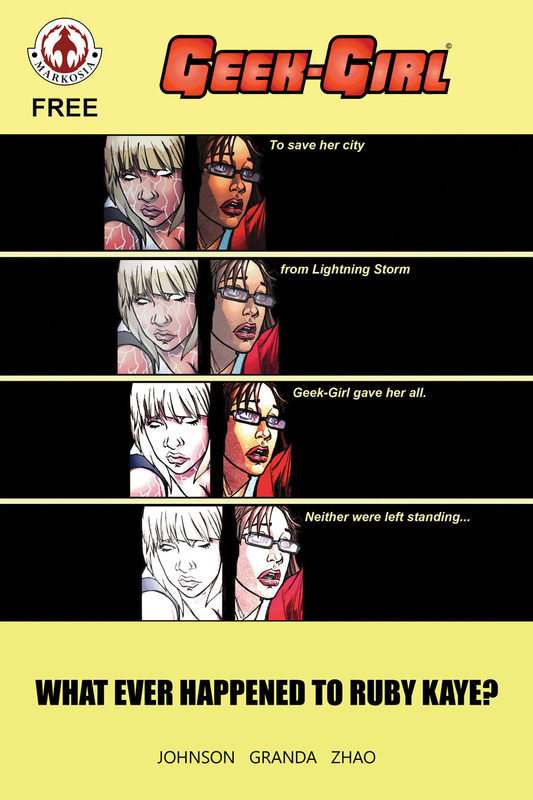 In the wake of Lightning Storm’s actions – in which she also took Neon Girl (Maine’s Numero Uno Super-Heroine) off the map, destroying her hand and putting her in hospital – law-enforcement is severely depleted, there’s a crime wave going on, and new-crooks-on-the-block The League of Larcenists are looking to clean up and grow in number. So where’s our Geek-Girl in all of this? Find out on Free Comic Book Day 2018 – May 5 – when Free Digital Comic Geek-Girl: Whatever Happened to Ruby Kaye? hits – featuring material from Geek-Girl vol.1 & and the forthcoming vol.2 – setting up the new Geek-Girl #1, also coming in May!